Design a Wedding Cassone (Intermediate) – Students select images from museum collections to “reassemble” a cassone (marriage chest), and then design one for themselves using contemporary imagery. Dowries (Advanced) – Dowries were a normal part of marriage negotiations in Renaissance Italy and remain important in some cultures. In this activity, students research contemporary dowry customs. BFF (Elementary) – Students consider Renaissance ideals of friendship and their own, and then create a double portrait of themselves with a best friend. What are they Selling? (Advanced) – Most of the art presented in this unit “sells” a certain image of self, family, or a relationship of some kind. 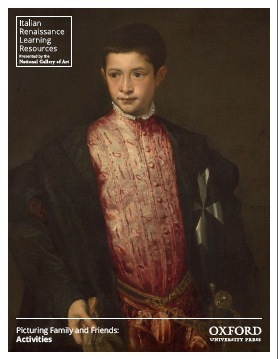 In this activity, students decode a contemporary advertisement using the same skills of visual analysis by which viewers of Renaissance art perceived the motivations of art makers.